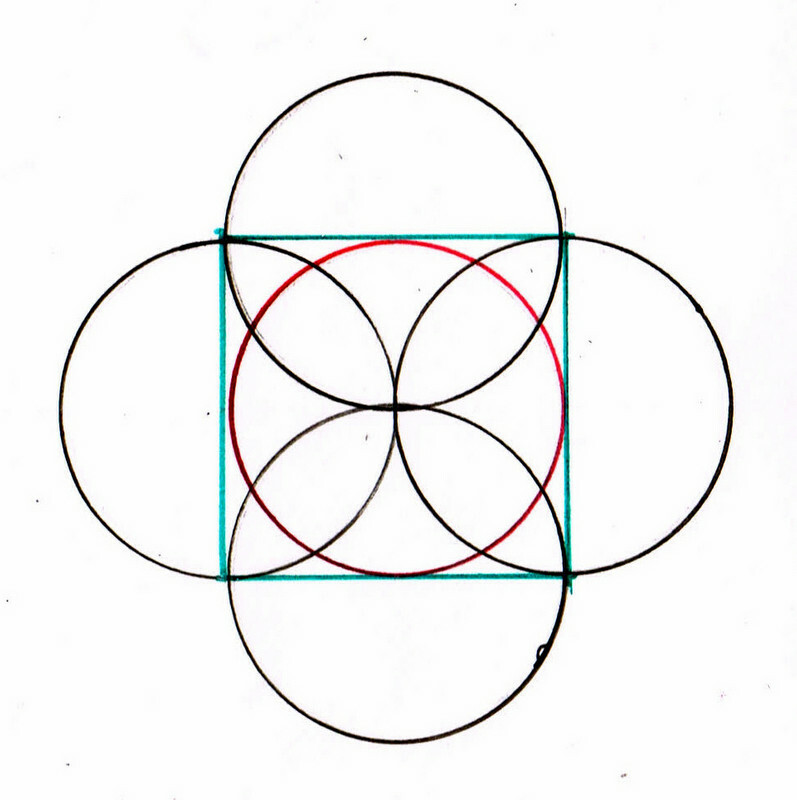 Jane Griswold Radocchia: Of Course Geometry is Magic! 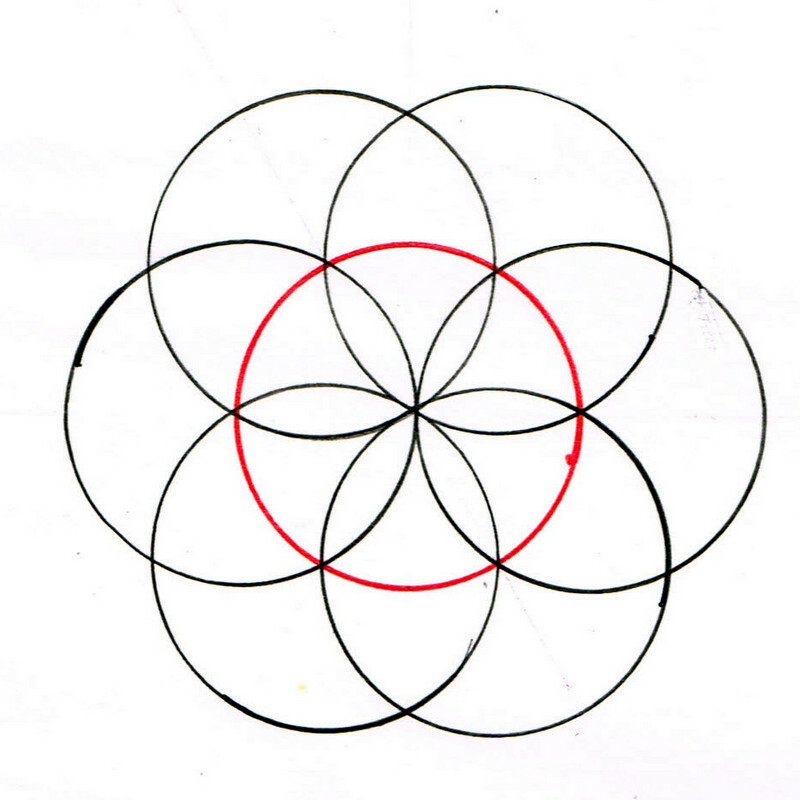 The technical word is 'apotropaic': these shapes are protective symbols. 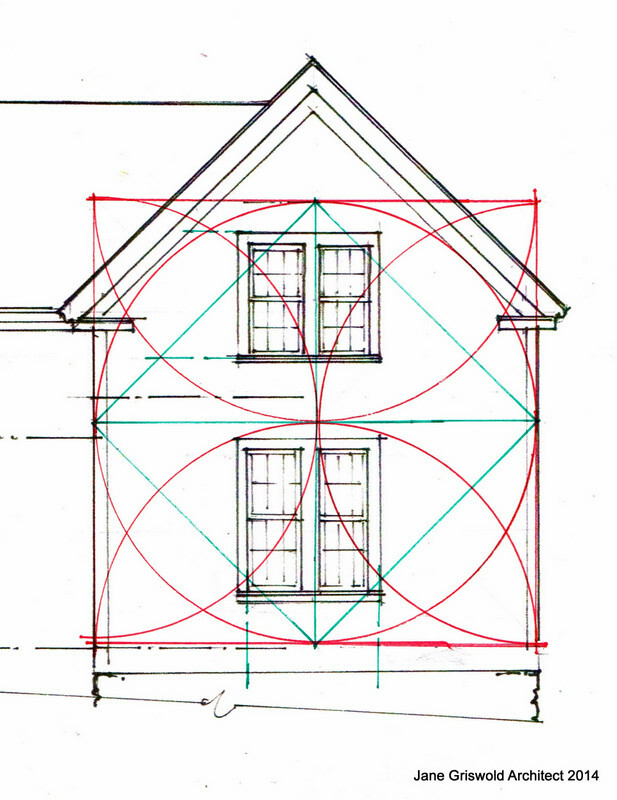 The basic shapes of geometry are perfect. They never change. So is it any wonder that we think these perfect shapes that we humans can not just imagine but also draw, are paths to the supernatural? Of course we see them as holy, sacred, mystical. A circle of any size always comes back upon itself. Its radius, diameter, and circumference are always in the same ratio to each other. If they aren't - it's something else, NOT a circle. 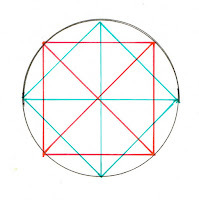 A triangle with sides 3, 4 and 5 units in length always has a 90*, square corner - seen here on the lower right side. 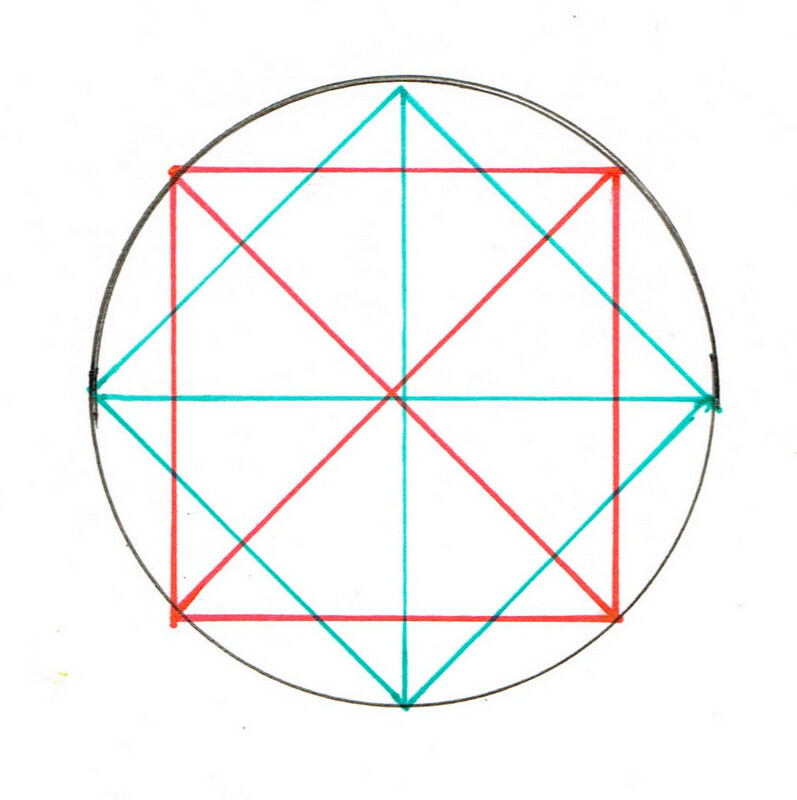 The square is always made up of 4 sides of equal length with 90' right angles. If any of those definitions is not present, it's not a square. 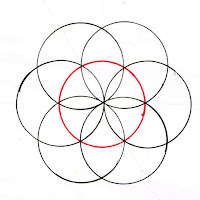 These shapes are part of each other: Here I've drawn a circle, some of its triangles, the squares that come from it. These are the simplest forms, combined they can become endlessly varied and complex. Geometry is science. On the grand scale geometry is the double helix of our DNA, the rotation of the planets. It is a basic in our natural world, the small scale: the bee's honey comb, the crystals in a geode, the reflection in a mirror, the ripples of a pebble in a pond. The Golden Section seen in the sun flower and conch shell is the expansion of these basic forms. Too many of us found only relentless logic in our high school geometry class. We didn't twirl compasses, make daisy wheels, stars, hexagons, pentagons, octagons... using just arcs, points, and lines. We rarely delighted in learning the magic of this world of patterns, proportions, rhythms that we are part of, that does not need words or numbers. Ionic volutes, daVinci's man, the tile in the Alhambra didn't grace our walls. 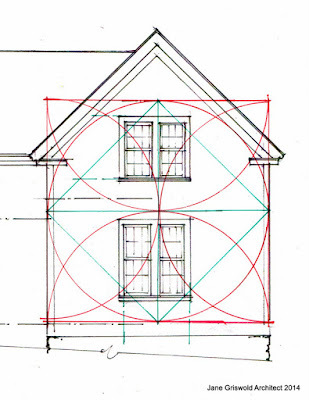 Practical Geometry is the use of geometry for construction: the arch of a Roman aqueduct or the cantilever of a suspension bridge, the vaulted ceiling and the rose window of a cathedral, the timber frame of a barn, the placement and size of architectural elements. It was used to build the pyramids, noted in the Bible. It is ancient, now mostly forgotten due to the Industrial Revolution. 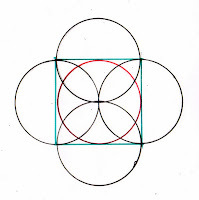 I study and blog about this practical geometry, part of our heritage which we no longer perceive, to help us recover it. I hope we will learn again to see it and use it. This is my favorite kind of magic.